I’ve bracketed these two together because (a) they were both on at the same place at the same time – The Photographers’ Gallery in London – and (b) I thought they might be good research for my current assignment. The title of the assignment is ‘A Sense of Place’ and both of these exhibitions relate to a place: the former a gigantic country and the latter a hip London district. I thought they might in some way give me inspiration on how to capture the essence of a place in photographs. I was only partly right… a brief review of each follows. I was initially a bit disappointed that the essence of ‘Russia’ wasn’t really coming through for me in the collection; it seemed on first viewing to be very much an examination of the development of photographic technology than a cohesive portrait of a nation. However, I went for a second go around the two exhibition halls and looked again at the pictures in their chronological groupings. What emerged on this re-examination was something much more subtle than I’d expected: the sense of ‘Russia’ that comes through isn’t so much in the pictures themselves, it’s in the ways they were made – the underlying story is of how the Russian people used what technology and materials they had to hand in order to make their images. And for long periods of time, what tech and materials they had access to was different to the rest of the world as it was artificially restricted by the communist government. So the history of colour photography in Russia is different to its history anywhere else. This underpinning narrative tells you more about the ‘sense of the place’ than individual photos do. It’s an example of the old maxim: the medium is the message. This was another thing entirely. Very surreal, very avant-garde. A mixture of photography and ‘urban sculpture’ made from discarded items from a market in east London. The photography was striking: lots of strong colours, and subject-wise a heady mix of rotting rubbish (arranged in intricate still-life poses) and wilfully arty street portraits. The sculpture parts left me cold; for some reason I can appreciate a good photo of, say, a pile of street trash, but when someone sticks a load of it together into a 3D piece of ‘art’ I find it faintly ridiculous. Lorenzo Vitturi is a former cinema set designer and painter, and this does come through in his work. He is unbound by conventions of photography and happy to experiment across media in an ‘art installation’ kind of way. To be fair, some of the street portraits did give a flavour of the place. The rotting bananas balanced on rotting vegetables, not so much. Maybe I’m missing some deeper metaphor here. So was this an interesting way to pass an hour? Yes, no doubt at all. Categories: Exhibitions, Research & Reflection | Tags: colour, Dalston, exhibition, Russia | Permalink. I’ve done a lot of thinking, reading and researching on how one might be able to evoke a ‘sense of place’ as a photographer. I realised early on that a lot of the exhibitions, books and photographers that I’d enjoyed and blogged about last year as part of the Art of Photography course were very much about places, and to varying degrees of success they managed to communicate a strong sense of the place being examined. I’ve revisited these and can summarise what I’ve learned in this research. Perhaps the most famous place-centric photo collection of the 20th century, The Americans takes the unenviable task of trying to depict one of the biggest and most populated places on earth. Whilst it’s difficult to encapsulate what defines such a vast and varied country – east and west coasts are very different, the midwest is something else again, specific cities have very distinctive identities – Frank did it very successfully, by identifying what is common to the multitude of cities and towns he visited. His use of recurring motifs is key to communicating the mood: specific icons of Americana – the stars and stripes, diners, jukeboxes, big automobiles – repeat throughout the book like a chorus, bringing a backbone of unity to what could otherwise have been a disparate collection of images. He shows both the breadth of the country and what unites its people beneath the surface. He is holding a mirror up to an entire nation, seeing it as only an outsider can (he was Swiss). He captured a mood, and it wasn’t wholly positive. Several images allude to the racial segregation that was still being suffered by minorities in the 1950s. A couple of less obvious thematic elements become apparent on closer examination: death is depicted or alluded to in several images; religious imagery, specifically the crucifix, makes a few appearances. Much of what has been said and written about The Last Resort centres on the style, the use of strong colours and daytime flash, quite unusual at a time when ‘documentary photography’ was predominantly black and white. However, what I was particularly looking for when revisiting the book was how Parr gets over the ambience of New Brighton as a place. The colour aesthetic is a big part of it – it’s a garish place and saturated colours help to get that across. But I think the way he really gets across the feel of the place is through his selection of subjects and shots – he may deny this was his intent, but it feels like he chose to emphasise (stopping short of exaggeration, I think) details that showed the place in a certain way – downmarket, scruffy yet an improvement to the regular lives of visitors (it’s almost as if he’s saying “imagine what their lives are like the rest of the year if THIS is considered a holiday!”). An unkind interpretation would be that this is a kind of ‘class tourism’, or even treating the subjects as some kind of anthropological study. However, coming from the class and generation that had holidays like this in places like this, I’d hope that he recognised the warmth and happiness with which families did genuinely enjoy holidays like this in places like New Brighton. Like Frank, he has an outsider’s eye that simplifies and symbolises. It’s unfortunate that the lingering motif for me was overflowing litter – but he chose this final selection of images for a reason: this is how he saw New Brighton. He makes the place come alive on the page by focusing on images that matched his vision. This show at the Media Space in London was in three parts: a selection of images from Ray-Jones from his collection on English seaside resorts in the 1960s, posthumously published as ‘A Day Off’; a revival of Parr’s early b/w work on the Methodist community in Hebden Bridge, clearly influenced by Ray-Jones; and a Parr-curated new selection of rarely-seen images from the Ray-Jones archive. The Ray-Jones shots in the first and third sections are fantastic examples of evoking a place and in particular a time. The seaside holidays enjoyed in the 1960s seemed to be a world away from the garish 1980s of The Last Resort – he employed more humour than Parr, gave over more of a sense of mild eccentricity – what one online reviewer called “the gentle madness that overtakes people when they feel they can relax and be their true selves”. Once again, a key aspect of Ray-Jones’ way of seeing the place and the people is that of the (in his case, semi-) outsider; though English himself, he’d spent many years in New York before coming back to see the old place with a NYC street photographer’s eye. Parr’s series on the Methodist communities in West Yorkshire in the 1970s (published as The Non-Confirmists) takes on a more targeted subject and focuses more on little peculiarities that make these people stand out slightly from the norms of mainstream society. It’s this focus on the small differences that helps to evoke the nature of the community. Once again (there’s a pattern here) Parr was an incomer to the community and so could see it in a way that long-term resident might not have been able to. An interesting project: photography as activism. Whilst the real story Neville was telling was about the legacy of deformity from contaminated land, the backdrop is of Corby as a community. The two aspects of the collection didn’t sit together that well for me, I found it a little jarring (maybe that’s the intention). With its strong Scottish heritage and culture, Corby is sufficiently interesting in its own right to have been the subject of a photo essay, and the activism narrative that overlaid it moved it into a different direction. Like Parr in his Hebden Bridge series, Neville is good at picking out the slightly incongruous details that mark out the place as distinctive: the child in front of a huge supermarket display of Irn Bru for example. The fundamental point of the Mass Observation initiative was to record life in Britain – a broad remit indeed. Photography wasn’t considered a key aspect of the ongoing experiment though, merely a form of visual note-taking to validate the written reporting. What emerges in the photography (much of it by Humphrey Spender) is more of an evocation of time than place; it’s a time-capsule of post-war Britain that illustrates the maxim that ‘the past is a foreign country’. It’s recognisable as Britain, but not the one we live in now. Certain aspects such as the images of workers in Bolton do carry some sense of the community and the place but in the end its the overall historical interest that lingers rather than a sense of place. It’s kind of strange to make the comparison, but thinking about this alongside The Americans it becomes apparent how important it is to have a coherent message in the photographs; otherwise they are just a bunch of historical artefacts. This speaks to the importance of intent in the photographer’s mind when shooting and selecting. Categories: Assignment 4, Assignments, Exhibitions, Photographers, Research & Reflection | Tags: assignment, books, exhibitions, people, place, research, sense of place, space | Permalink. The Théatre de la Photographie et de l’Image in Nice is running an exhibition of Steve McCurry’s work until the end of September 2014, and I was fortunate to be in Nice at the right time to visit. Like most people I knew McCurry first and foremost for the iconic ‘Afghan Girl’ image, so famous that I don’t need to include it here. Beyond that, I knew he had worked a lot in Asia and in war zones throughout the world – but I didn’t know much else. It turned out to be one of the best exhibitions of photography that I’ve seen in a long time. Given that I am studying a degree module called ‘People & Place’, his work is hugely relevant and an excellent source of inspiration. At the heart of McCurry’s work are people, and the first hall in the gallery is dominated by head-and-shoulders shots that are reminiscent of Afghan Girl, with the subject staring deep into the viewer’s eyes. The technique of getting the subject to stare intently at the lens looks deceptively simple, but I can’t imagine that every time you do so, you produce work as powerful and affecting as this. 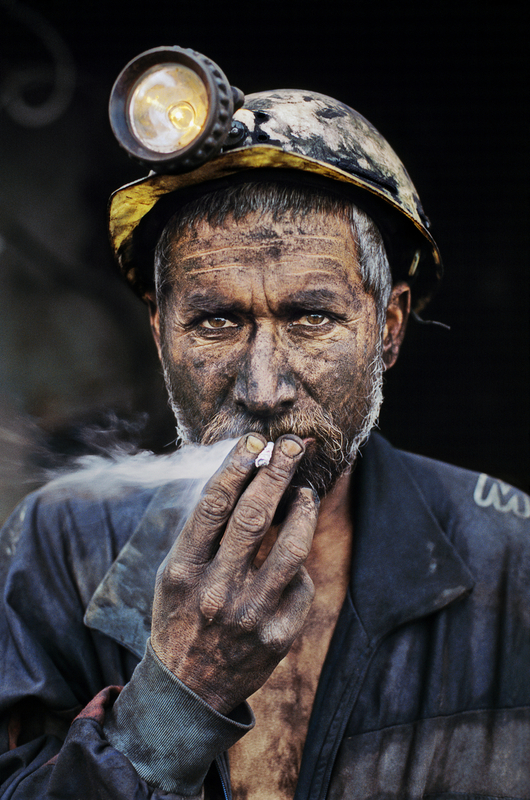 Whether through empathy, patience or some other interpersonal skill, McCurry has the knack of drawing the gaze of his subjects in such a way that you feel they are revealing something of themselves to the camera/viewer. Pure portraiture isn’t the whole story though – in fact it’s a fairly small proportion of the 127 images on show here. The greater part of the body of work is concerned with placing people in the wider context of their place in the world – their community, their traditions and sometimes the extraordinary circumstances in which they find themselves. For me, some of these are more interesting than others. The images of war zones – and they are not overly graphic, they are not scenes of combat but rather of the effects of war on the people and their environment – were surprisingly less affecting to me than I expected. Similarly, the images of the aftermath of natural disasters didn’t really resonate with me. This is a subjective view, of course, but a certain amount of ‘disaster fatigue’ kicks in after a while and as a viewer I became somewhat desensitised. On the other hand, the images depicting specific traditions of peoples from around the world, I found genuinely impressive. The ones chosen here really lend themselves to being captured photographically, from a point of view of colour, composition or both. The Indian festivals where they paint their faces and bodies bright colours, the Shaolin monks hanging upside down, the Sri Lankan stilt fishermen – they make amazing photographs. They make you think about the wonders the world has to offer, the unusual rituals and sights that most people will never see in person – the variety of human life. Put cynically from a visual interest point of view: misery tends to look the same the world over, but people find a limitless number of ways to celebrate and be happy. I was particularly interested in seeing how McCurry conjured up the sense of place in his images, as this is the brief for my next assignment. For the most part he does this with people in the context of the place – sometimes posed environmental portraits, often candid moments. The light, the architecture, the clothing, the landscapes. After a while, looking at photos before reading the captions, I became pretty good at guessing where in the world the picture was taken, and this is testament to his ability to distill a place down to its essence. With regard to the balance between people and place in his images, on the evidence of the work here he concentrates very much on the people, with the place as a secondary character. One of the best examples of this, as well as demonstrating his love of vibrant colours and his eye for composition, is ‘Boy in Mid-Flight, Jodhpur, India’. My overwhelming first impression was that I was in the presence of a photographic master, the kind of annoyingly brilliant genius that makes me disappointed in my own shortcomings! Once I got past the general sense of awe I looked more closely and saw that what I really admired were two quite distinct aspects of his work: first, on a purely aesthetic level he captures some beautiful images, full of colour and with a careful eye for composition; secondly, he has a rare skill of highlighting the human elements, making you feel like the subject has shared something of themselves with the photographer, and by extension, the viewer. One simple sign that I’ve been impressed with a photographer is whether I subsequently seek out more of their work. Straight after getting back from the exhibition I ordered ‘Steve McCurry: The Iconic Photographs’ , which seems to be a comprehensive source of more great McCurry images to feast upon after having this show whet my appetite. One of the things I find myself thinking with regard to certain photographers is “I like the way s/he sees the world”… and with McCurry the emphasis is more on the last word. He brings to life amazing, exotic aspects of global culture, opening windows onto parts of the world I’ll most likely never see in person. If anything, the fact that he is so associated with one iconic image is something of a shame – it overshadows what is a consistently excellent body of work. Categories: Exhibitions, Photographers, Research & Reflection | Tags: colour, composition, disaster, exhibition, people, photographer, portraits, Steve McCurry, war | Permalink. As noted in my Assignment 3 write-up, I found it a little difficult to get into the Buildings & Spaces section of the course, particularly due to a lack of guiding inspiration from existing photographic sources – a problem that didn’t occur at all with People Aware and People Unaware. Compared to the flood of examples of portraiture and street photography, there is a relative drought of photographic works that depict buildings and spaces in use. There is a lot of inspiration around if you’re looking for purely architectural or aesthetic imagery of buildings, but that’s not what I was looking for here; I was searching for examples of photography that effectively showed how a space is used by people – in my view this was at the heart of the assignment. The one source I found that broke me out of my ‘photographer’s block’ was Foto/Industria . It’s a boxed set of small booklets (bigger than pamphlets but not quite books) to accompany a curated series of 17 exhibitions in Bologna, Italy, of the same name – all themed around business and industrial photography. Of the 17 collections, there were a handful that caught my attention. They fall into a mix of the second and third categories above – those that focus on the buildings themselves and those that cover how people use the buildings in their work. Originally an architect, Basilico’s work is typified by strong geometric shapes, lines and in many cases, repetition. He brings out the corporeal nature of industrial buildings by often focusing on their networks of pipes, wires and ducts that move the necessary solids, liquids and gases around the structure. Some examples of his work give the impression of a factory as a living, breathing entity – robotic or alien perhaps, but sentient nonetheless. Aesthetically, his work is what you might call traditional industrial style: mono, high contrast, gritty. Last year I visited an exhibition of David Lynch’s industrial photography and I can see parallels – albeit Lynch’s work focused more on disused and decaying industrial buildings. In comparison, Gruyaert has taken a very different aesthetic approach. He is lauded as one of the pioneers of colour photography, and his industrial images are, in comparison to those of Basilico, bright and colourful. His pictures really pick out the colours prevalent in certain industrial environments. Sometimes the colours are very strong and saturated, sometimes more pastel-toned, but often surprising the viewer who might expect industrial environments to be grey and oppressive. More than the others featured here, he gets beyond the spaces and introduces the people, showing how they interact. Again he plays close attention to colour, often theming a picture around a particular colour such as the green overalled man in the green-painted Cogema plant, or the blue uniforms of the Niger workers against the pale blue backdrop. Like Gruyaert, this photographer caught my eye due to the way he seems to have developed a unique way of seeing industrial environments. His distinctive vision is based on a kind of ‘hyper-real’ high-key luminosity that renders his subjects pale, pastel-hued and often somewhat ethereal. Again, like Gruyaert he subverts the notion that industrial environments are dark, dingy, grimy and grey. In some photos the juxtaposition of heavy industry and the almost dreamlike lighting style is quite beguiling – as a viewer you find yourself staring at them, trying to decipher: is this a real industrial workspace, or a stylised set? One does wonder how accurate a depiction it is – either he shoots photographs in sanitised environments (before they’re actually used?) or there’s a bit of post-processing going on. Either way, the end result is that through his eyes you see industrial complexes in a very different way than you do with more traditional executions. This is an example of a very focused project, the building of the Airbus A380 superliner. Power does an excellent job of depicting the scale of the activity as the component parts of the place are manufactured in plants in various countries before being assembled. Again I was attracted partly because of the aesthetic: he finds some interesting, borderline abstract, compositions that lift these images above factory-floor snapshots, and his use of strong blocks of colour are visually striking. Many of the images seem to be concerned with demonstrating the epic size of the end product; a person here, a propped-up bicycle there, a lorry cab dwarfed by a section of cabin – all give a strong sense of scale. The last of the booklets to be worthy of mentioning here is a compilation of images from ‘company photobooks’ that businesses used to produce to promote themselves and/or give to staff and visitors as mementos. Some are more posed and portrait-like in appearance, but the more interesting ones are those that depict (seemingly unposed) examples of people at work. Some of the working situations are quite distinctive to a particular sector or even company, and it was these that I found most interesting in the context of assignment research – the images that really showed how a workplace was used by the workers. Seeing these examples was where the assignment started to fall into place for me. I didn’t seek to directly emulate any of the techniques I saw in the exhibition booklets in the final assignment – I only included one actual working space (the coach renovation workshop) and one former working space (the converted iron foundry). However, the overall effect of the set of booklets was to open my mind somewhat to the opportunities for taking pictures of spaces designed for a particular purpose, and for that much-needed general inspiration I’m very grateful! Categories: Books, Exhibitions, Photographers, Research & Reflection | Tags: book, exhibition, foto industria, Gabriele Basilico, Harry Gruyaert, industry, Mark Power, Massimo Siragusa | Permalink. As I’ve just started People & Place, and the first section is about portraits, it seemed highly appropriate that the first exhibition I go to is David Bailey’s Stardust at the National Portrait Gallery in London. Bailey is probably Britain’s best known living photographer, and for a while his name was synonymous with the craft (“Who d’ya think you are, David Bailey?”). He is undeniably ‘mainstream’ in this respect and I guess many critics might look down their noses at this ‘East End lad made good with his one photographic style’. But of course the reality of his career and work is a bit more complicated than that. Yes, over half of the 250+ works on display are indeed in his signature style: celebrity portrait, mono, plain white background, starting with his ‘Box of Pin-ups’ and going right up to the present day. There’s also a surprising amount of other styles he worked in: there’s colour work; there’s the 1960s fashion shoots that first brought him to fame; there’s some more personal, family shots; there’s images from humanitarian trips to India and Africa; there’s candid images from the old East End; there’s nighttime city shots taken on smartphones. Some of his un-Bailey-like photos really impressed me, giving a glimpse of the kind of photographer he might have become on a different career path – the early East End picture essay material in particular had a real warmth to it, that doesn’t come across so much in the celebrity work. The poster they give you as part of the programme (above) is just a great shot, not typical Bailey at all but full of visual sparkle – the lines, the shapes, the text, the face, the jacket just being pulled down off the shoulders, the cheeky eyes. For most of the visit I was drawn back to the classic Bailey portraits. Some I’d seen before and still work fantastically well – Jack Nicholson, Lennon and McCartney, Jean Shrimpton, Kate Moss, Mick Jagger, the Krays of course – and others were entirely new to me, despite their age. The mid-60s portraits of David Hockney and Brian Epstein, for example, showed he could be experimental with posing and editing when he wanted to be. Looking at many of the portraits you initially get the sense that he has the knack of getting under the skin of his sitters to bring out aspects of their character… but the more of his celebrity portraits you see in one place, the more you get a feeling that it’s actually quite a surface thing – he’s isolating and heightening what we already know about the sitter, almost like a subtle form of caricature. He rarely seems to give any hints to the hidden essence of a person, or secret undercurrents of their character. He prides himself on getting to know the sitter quickly and rattling off the pics, click-click-click. The work where he has more of a personal connection is quite different – the Shrimpton pics and particularly the room dedicated to his wife Catherine show how much more depth you can mine in a subject when you really know them. By comparison the celebrity shots are like one-night stands. I noted in various bits of publicity around the show that one of his hobbies is ornithology – there’s an obvious parallel with his work, particularly his celebrity portraits. He’s quickly identifying aspects of quite fleeting subjects, collecting them, ticking them off. He’s a professional people-watcher. On a technical note – and this is relevant as Bailey himself produced new prints expressly for this show – some of the images are so underexposed as to look faintly ridiculous: Don McCullin, Brian Duffy and Damon Albarn look as if they’re wearing blackface makeup – not a good look. A perplexing creative decision indeed, and very distracting. So, on the evidence of this exhibition, one can see why he gained the reputation that he did: he is exceptionally good at simple, black-and-white celebrity portraits, as long as you accept that these are what they are; they’re not deep, insightful, thought-provoking pieces of art (Bailey himself has several times described his job as ‘taking sophisticated passport pictures’). A more discerning curator may have chosen a smaller selection of his untypical work. Having said all of that: I did buy a book  in the gift shop, the poster above is now on my office wall, and I’m trying to get hold of a print of a Morecambe and Wise shot of his that I love. If this isn’t damning with faint praise, he’s very good at what he does! Categories: Exhibitions, Photographers, Research & Reflection | Tags: celebrity, david bailey, exhibition, mono, national portrait gallery, portraits | Permalink. I'm Rob Townsend, my OCA Student ID is 511892 and this is my Learning Log for the distance learning course: People & Place.